What’s more human than progress? No matter how far we’ve come, there’s something inside that keeps us striving to the next level. What is this for you? What does it take for you reach it? What do you need when you get there? 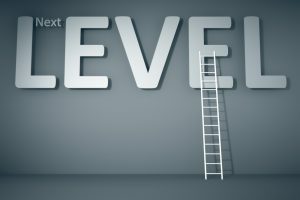 About reaching the next level is that, by definition, it requires something beyond this level. Whether it’s taking your career/business to another level, getting in better shape, getting more skilled, or any other goal requires something beyond where we are now. In gaming, leveling up requires navigating your current level, collecting keys, earning points, overcoming an ordeal, whatever it is demands you collect what you need before ascending. This test determines if you’re qualified to pass, and also ensures you have what you need to succeed at a higher level. When a hike turns into technical climb it’s too late to turn around and go get your rope. To pass to the next level you must be ready when you arrive. In our careers it’s natural to think we get promoted when we’re successful, but in fact we get promoted to test if we can succeed at a higher level. An NFL player doesn’t succeed by playing college ball. We can be fooled into chicken and egg thinking that when we make it to the next level we’ll step up our game, but by definition we step up to be here. This isn’t only having the capabilities we need to succeed, but also the self-image. As was perhaps best put by Maxwell Maltz some 70 years ago, we only achieve goals that are consistent with who we perceive ourselves to be. And to reach the next level we must not only become this person, we must be them now. Acting as if, we fail. Daniel Craig does a nice job acting as a cold killer, but you’d hardly want him covering your six in a gunfight. To reach that next level, we can’t fake it till we make it, we must make it now to take it there. It’s easier to ogle a man or woman you think is “out of your league” than it is to step up leagues. It’s easier to look at someone in much better shape than you and wish you were there. It’s easier to look at a business builder and think you can do a better job, than it is to actually build. And no matter what the goal, no matter how hard it seems to get there, it’s always easier to reach that next level than to actually succeed there. In school basically everyone gets promoted to the next grade, but life has a higher standard. To crush the next level, you must show up as the person who already is. Here’s 3 things to take you there. If acting as-if fails, then how do you best reach the next level in your mind? There’s no such thing as failure, only feedback, yet this is the paradox of leveling up for even many highly successful people. They want so desperately to reach the next level but they’re terrified of failure, which means they never build the capabilities they need to get there. For instance, every leader must well-communicate to groups, so, by definition, anyone who is afraid to look silly public speaking will never really lead. You can spend all day every day sitting back imagining yourself standing on the stage performing flawlessly, but like watching every Richard Simmons video, you only get in better shape doing it. It’s these “reference experiences” that convince your brain you’re at the next level, and also build the capabilities you need to succeed here. Do those next level things over and over again and you convince yourself and others that you’re here. Barack Obama never waited for the country to tell him he was capable of being president. He became president in his own mind, and then kept standing until other people believed him. Wherever you’re headed assume that it demands more of you than where you are. Even our most basic form of space travel is only possible because astronauts spend years preparing. Like someone training for a marathon, they don’t reach the heights of space by one day waking up thinking they are ready, but over time executing a process that gets them ready. No matter where you’re headed there’s a process that best gets you here, and enables you to succeed once you are. A car company doesn’t reach a new level of innovation by rolling more cars off its production line, but by creating a process to build another line. No matter where you’re headed, what is your best process that not only gets you here but equips you to excel? Like this article on professional swimmers, The Mundanity of Excellence is that we elevate ourselves through small incremental process improvements that make us better every day. Even once I’d made it to Goldman Sachs I still didn’t get the importance of building winning skills. I got there through brute force, working around the clock in university I earned top grades, but without any tools like speed reading and memory techniques I burned a lot of life. Getting the job was much the same—hundreds of hours of ROTE interview preparation, instead of walking in with highly trained skills of influence. Once in the seat I went at it the same way, working 100 hours a week, “doing everything I could,” rather than actually winning through getting better. In the business world success is talked about a lot like hard work, but no other arena looks at success this way. Nobody looks at Floyd Mayweather and thinks he wins by out-hustling other fighters… Navy SEALs don’t win because they work at it harder than anyone else. The most skilled fighters on the planet win by working hard to be better than the enemy. Most bankers are still “working hard” fighting their war on work like terrorists throwing rocks. Although it’s a sales job, few admit it, so they never develop any skills of selling, hoping to win through working harder basically 95%+ fail to keep leveling up. Like every candidate that took on Obama and Trump experienced, elevating takes winning skills. And in real tough arenas of success, even that isn’t enough to succeed once you’re here. A reason I love personal development is because you can never finish. Perhaps the purpose of life is to stay at the same level, working with the same people, talking about the same stuff, standing around the same bars, watching the same TV shows, playing the same games, but I like to think we’re here for more. Since I was a kid I’ve wondered how far I can take this one lifetime, and getting better is the only way I know how. To keep leveling up, keep “be-ing” the person who is already here. I'm Geoff Blades. an author and advisor to senior Wall Street professionals, CEOs, and other leaders, on all topics related to getting what they want in their businesses, careers, and lives. How do you get what you want in your career and life? Download the first four chapters of my book, Do What You Want, to learn the most advanced processes, skills, and mental models you need to win in your career. © 2019 Geoff Blades. All Rights Reserved.